A Secret Service agent cleans the presidential limo before the arrival of Marine One carrying President Donald Trump at the Downtown Manhattan Heliport, Sunday, Sept. 23, 2018, in New York. Trump is riding around in a new set of wheels. A sleeker version of the armored presidential limousine known as “The Beast” is ferrying Trump around midtown Manhattan, where he is attending the annual U.N. General Assembly session. 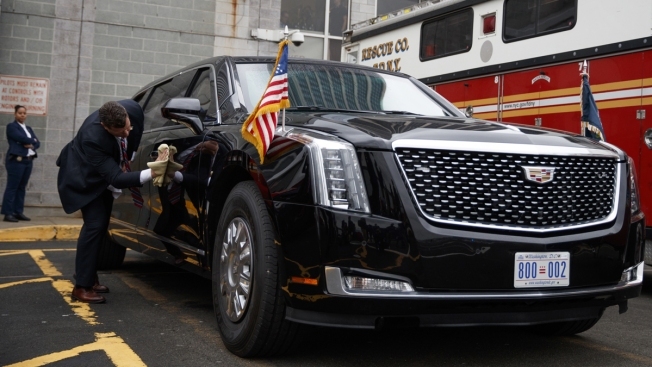 The newest version of the heavily armored presidential limousine known as The Beast rolled out this week during the United Nations General Assembly, and it's full of threat-neutralizing tricks, NBC News reported. The souped-up Cadillac is thought to carry a mix of armors, run-flat tires, tear gas, electric shock-equipped door handles and more. It is sealed from biochemical attacks and has medical supplies on board, including blood in the president's blood type. Commissioned by the Secret Service in 2014, the dozen new vehicles were initially expected to cost $15.8 million — the agency is tight-lipped on specifications about the roughly 20,000-pound vehicles.